Some information for this article was adapted with permission from an online series by JMT; jmtusa.com/maintaining-press-brakes. Having and following a plan is a sound practice when it comes to taking care of your press brake’s mechanical and electrical systems, hydraulic circuit, and tooling. Here, then, are some simple steps to follow. This first one is the simplest, and one of the more important steps for maintaining your press brake. While your equipment manual likely is found on a CD-ROM computer disc, keep a hard copy with your machine where your operators can use it, perhaps near the electrical panel. Also, keep a hard copy, along with the disc, in a safe storage area away from the machine. Your manual should include a diagram showing required lubrication for parts and a schedule to follow. The schedule is based on an 8-hr. work day, so if you’re running three shifts, you’ll need to lubricate three times sooner. The manual also will include charts and timetables for the hydraulic oil, filters, etc. Check the air filter on the oil-tank cover. Check pump and pressure-relieve valves for maximum pressure. Clean the tank and suction filters thoroughly. Check all bolts and screws for tightness, and if any are loose, check their condition; if they are stretched, replace them. Calibrate or realign backgauge and stops. Maintain proper clearance between ram gibs according to manufacturer specifications. Operation of all machine functions and safety features. Perform a visual inspection of tooling before each use in order to keep it clean and free from mill scale. Cracked or damaged tooling must be returned to the tooling manufacturer for reconditioning or replacement. Keep your press brake wiped down and clean. Dust and dirt are your machine’s enemies. So, too, is rust. Your machine should have a rust protectant applied to surfaces prone to rusting. Keep the backgauge clean, remove and clean cooling fans and vent filters monthly, keep electrical cabinets closed (except when accessing for safety or cleaning); keep the hydraulic-pump motor clean of dust and dirt; and clean safety lasers daily with a non-abrasive cloth to avoid buildup and scratches. A junk-free press-brake area will help to keep dirt and dust away from the equipment, while improving worker safety and productivity. 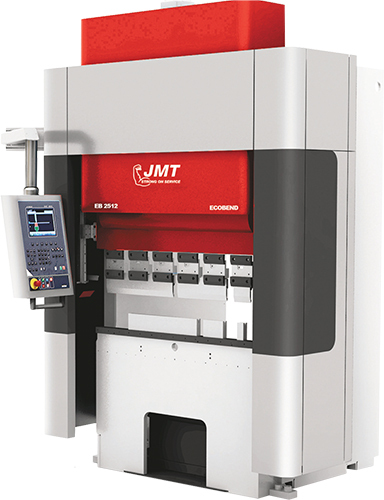 • If the press brake isn’t running using a new program, try running it with an old program. If it works, an issue may have been created with the new program.